Learn how Insperity can help NVTC members run better, grow faster, and make more money! The partnership between Insperity and NVTC provides preferred member pricing on select Insperity® HR solutions. As an NVTC member company, you can customize your back office from the many products and services Insperity offers. For many business owners, there just aren’t enough hours in the day to get everything done. And up to 25 percent of business owners’ time is wasted handling employee related paperwork, according to the Small Business Administration (SBA). Itching to prove the ROI of your HR team in a big way at your company? See how three important tech systems can give you an edge on the everyday tasks that demand most of your time. Can your company culture be deterring skilled candidates? Discover common mistakes that could be keeping you from building a dynamic workforce. Are mythical tales about PEOs the only thing preventing you from outsourcing your HR (and saving you a world of headaches)? Check out these five fables that are nothing more than folklore. Outsourcing even a portion of your company’s HR administrative duties can add hours of potentially productive time to your week. 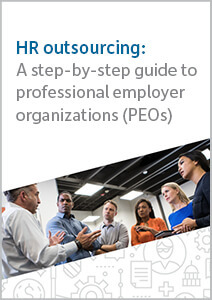 Discover five ways a PEO can help you do less and still get more work done. HR outsourcing can take many forms, from basic payroll processing and timekeeping to complex regulatory compliance and benefits administration.